Click here to view or download the pamphlet. From the Occupy Movement to the Movement for Black Lives, one doesn’t have to think hard to imagine how the state responds to social movements that challenge the racial and economic status quo. 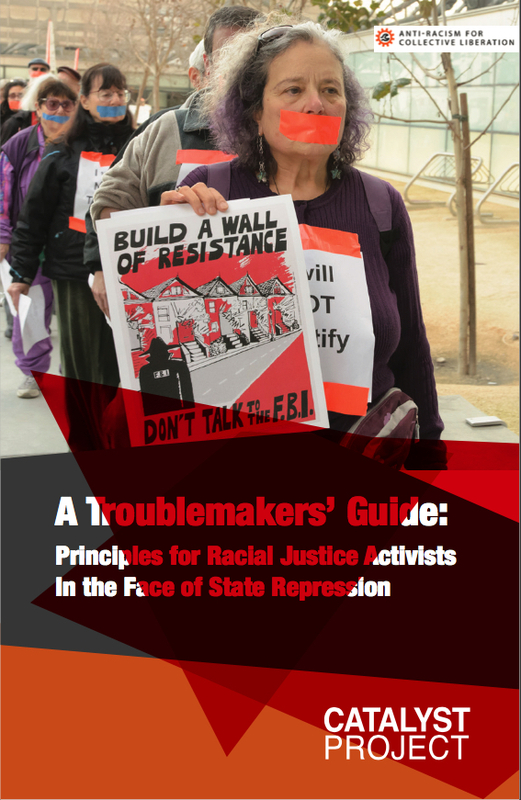 We created this document to contribute to important conversations about how and why the state uses violence and coercion to suppress social movements—and how to resist it in ways that are aligned with our racial justice values. These are lessons we’ve learned over years from mentors, current and past movements led by people of color, and our own organizing experience. We hope writing down these learnings will contribute to building unity about the need to resist state repression by every means possible – from campaign work to the culture and practices of our organizations. We have seen tear gas, batons, sound cannons, rubber bullets, and water hoses in below-freezing temperatures used from Ferguson to Standing Rock. Yet, some of the state’s methods are more insidious: spreading false information; creating or intentionally widening divisions and conflict within movements; and using violence and the criminal legal system to harass, harm and intimidate activists and scare off supporters. We know that people who don’t understand the role and methods of the state are more vulnerable to its manipulation, and can make our movements more vulnerable to its violence. It’s very important that white activists and organizations are not a “weak link” in security practices.